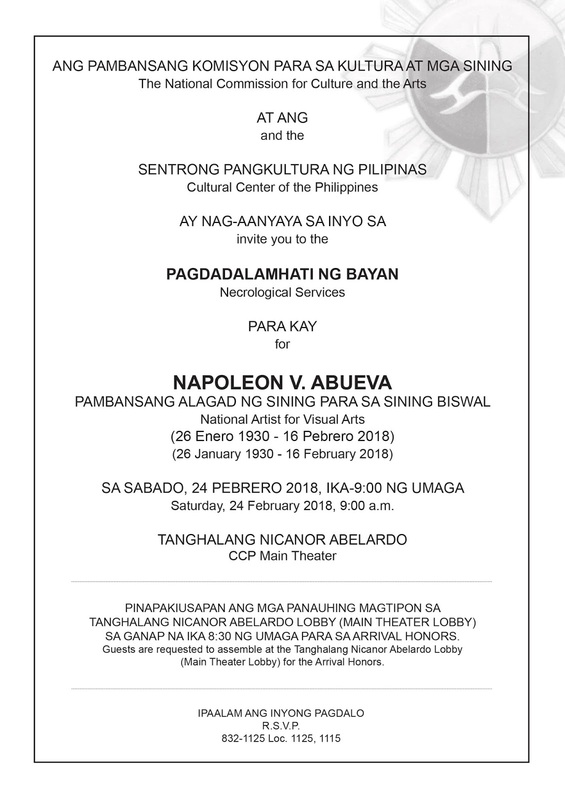 The Cultural Center of the Philippines pays tribute to the late National Artist for Sculpture Napoleon Abueva through a state necrological ceremony to be held on February 24 (Saturday), 8:30a.m., at the Tanghalang Nicanor Abelardo (CCP Main Theater). It will be followed by an internment at the Libingan ng mga Bayani. The nation mourned the death of National Artist Abueva last February 16, at the age of 88. Abueva’s wake is at Delaney Hall of the University of the Philippines Chapel. He is survived by his wife Cherry and three children, Amihan, Mulawin, and Duero. Known as the “Father of Modern Philippine Sculpture,” Abueva was the youngest National Artist awardee, receiving the highest award given to Filipino artist at the age of 46. He was conferred the Award in 1976. 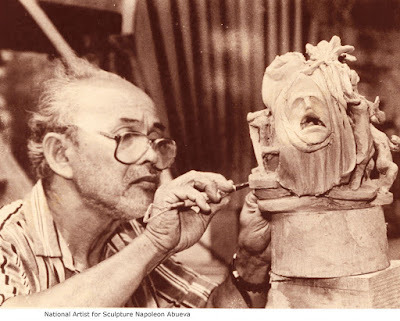 Born on January 26, 1930, the master artist has shaped the Philippine sculpture scene by utilizing local and indigenous materials such as molave, acacia, ipil and kamagong to create artworks replete with his nationalistic sensibility. He has also utilized other modern resources like metal, steel, cement, marble, bronze, and brass. Adept in either academic representational style or modern abstract, the Boholano artist pioneered the buoyant sculpture, an early artistic innovation where the sculpture juts out from the surface of a placid pool, in 1951. He was one of the first Filipino artists who have put up a one-man show at the Philippine Center in New York in 1980. His piece, The Sculpture, can be seen at the United Nations headquarters in New York City. Among his notable works include the Blood Compact Monument in Bohol, Eternal Garden Memorial Park, UP Gateway (1967), Nine Muses (1994), UP Faculty Center, Sunburst (1994) at the Peninsula Manila Hotel, the bronze figure of Teodoro M. Kalaw in front of National Library, and marble murals at the National Heroes Shrine in Mt. Samat, Bataan. He also designed the door handles in all the National Museum galleries. 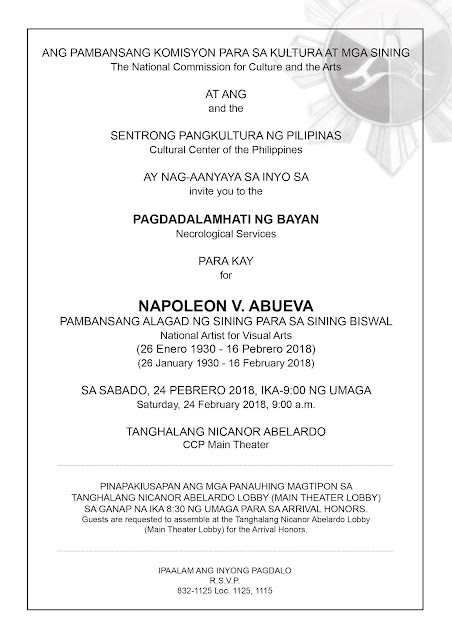 Join us in paying tribute to the late National Artist for Sculpture Napoleon Abueva through a state necrological ceremony on February 24, 8:30 am at the CCP Main Theater. The event is open to the public.